All these while I have only been using Hada Labo Super Hyaluronic Acid face wash (claimed to have twice the moisture retention capacity. Not sure what this is though!). I use it once or twice a day, depending if I do not fall asleep with Baby Iqbal while nursing him. As I have mentioned before, it cleans my light make up very well and does not dry my skin. Been talking and exchanging knowledge with my best friends about this. One of them suggested me to use Bio Essence Tanaka White products range. 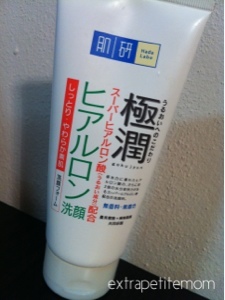 She said it works well on her skin and since we kinda have a similar skin type, it MIGHT going to work for me too! While checking the Bio Essence site and after reading, Hydra Spa range attracted me more just because it hydrates, protects and nourishes skin which I prefer instead of whitening. Went to Hua Ho to check, they do not have Hydra Spa instead Tri Action Aqua Boost which I suppose is similar. After much deliberation and thinking, reading reviews, comparing pros and cons - not that I am a beauty products expert. So between Bio Essence Tri Action Aqua Boost and Tanaka white, I have finally decided to try ??? Baby Iqbal turns 10 months! New Lust: Michael Kors "Look for Less"